Town in the ancient province of Dauphiné, France. Jews dwelt there as early as the tenth century (Gross, "Gallia Judaica," p. 191). 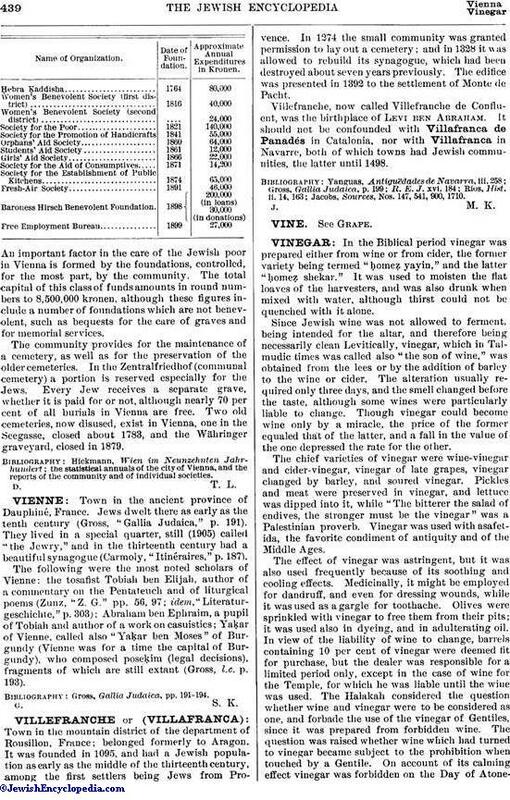 They lived in a special quarter, still (1905) called "the Jewry," and in the thirteenth century had a beautiful synagogue (Carmoly, "Itinéraires," p. 187). The following were the most noted scholars of Vienne: the tosafist Tobiah ben Elijah, author of a commentary on the Pentateuch and of liturgical poems (Zunz, "Z. G." pp. 56, 97; idem, "Literaturgeschichte," p. 303); Abraham ben Ephraim, a pupil of Tobiah and author of a work on casuistics; Yaḳar of Vienne, called also "Yaḳar ben Moses" of Burgundy (Vienne was for a time the capital of Burgundy), who composed poseḳim (legal decisions), fragments of which are still extant (Gross, l.c. p. 193). Gross, Gallia Judaica, pp. 191-194.